Finding time to grocery shop and cook can be challenging, especially when you're always on the go or if you're not as mobile as you used to be. While numerous meal delivery options are available to choose from, finding paleo meals that also taste great is a bit trickier. Fortunately, paleo dieters have many options for meal delivery. Cost: $120 for 15 meals weekly; about $8 per meal. When choosing Top Chef Meals as your paleo delivery option, you'll receive ready-prepared healthy, high-protein meals that taste great. You can pick and choose which meals you want to order each week. The cost per meal is lower than many competitor paleo meal services. Top Chef Meals offers less variety and fewer options than competitors specializing in pre-prepared paleo meal service, so you may get tired of eating the same meat and vegetables week after week. You can order Top Chef paleo meals -- such as sliced flank steak and eggs with pork sausage for breakfast, grilled portobello mushroom chicken with ratatouille for lunch, or chicken cacciatore with broccoli for dinner. Cost: $13 to $17 per meal, depending on how many meals you buy at once. Because Pre-Made Paleo delivery service specializes in paleo meals, a wide variety of options are available for you to choose from. Plus, meals come pre-prepared, so you just have to reheat and eat. Compared to other delivery services that offer paleo options, Pre-Made Paleo is slightly more costly. Order Pre-Made Paleo meals, such as chicken hash, turkey, or pork sausage skillets for breakfast, BBQ chicken with green cabbage slaw for lunch, or rosemary braised beef with broccoli and carrots for dinner. Cost: $14 to $20 per meal, depending on how many meals you buy at once. Pete's offers a wide variety of foods and meals, catering to groups such as athletes or people trying to shed pounds. The meals are pre-prepared to save you time in the kitchen, and vegetarian options are available. While the meals are healthy and taste great, they are costly. Also, breakfast options aren't available. Order Pete's Paleo meals, such as mushroom, carrot, rutabaga, chicken game stew, grass fed clove braised beef with butternut squash and beets with greens, or herb duck with Brussels sprouts and braised red onions. Green Chef recipes received positive reviews about the taste of their food from Yelpers, and every week is a new menu. You can choose from two-person and family plans, but not individual meals. Also, breakfast options aren't available. While the ingredients are delivered to your door, you still have cook meals yourself, which adds prep time. Order Green Chef meals, such as shrimp scampi, almond pesto cod, or sausage stuffed peppers. The cost of Sun Basket meals is low to average compared with other paleo delivery services, so you won't break the bank when purchasing the products. 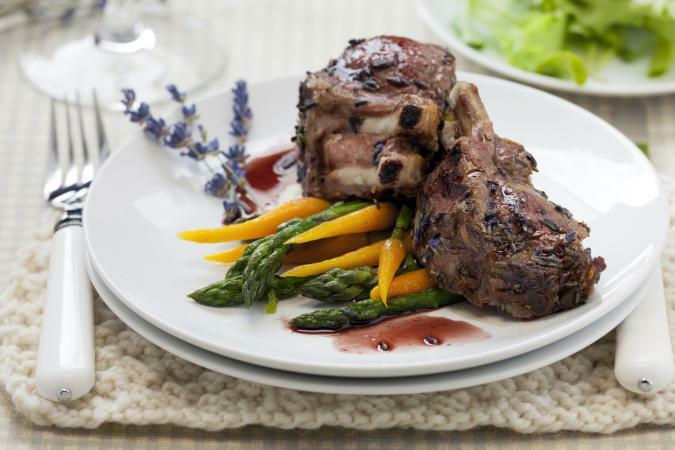 You'll find a nice variety of high-quality, nutritious paleo meals to choose from. Chef Shailynn Krow says you can only order a certain number of meals per week depending on the plan you pick. Likewise, you have to prepare the meals yourself after receiving the ingredients, which means added prep time. Order Sun Basket meals, such as sausage-mushroom scramble for breakfast, sesame-crusted salmon with cara cara orange and roasted carrot salad for lunch, or Italian sausages with kale, parsnips, and harissa-spiced cashews for dinner. 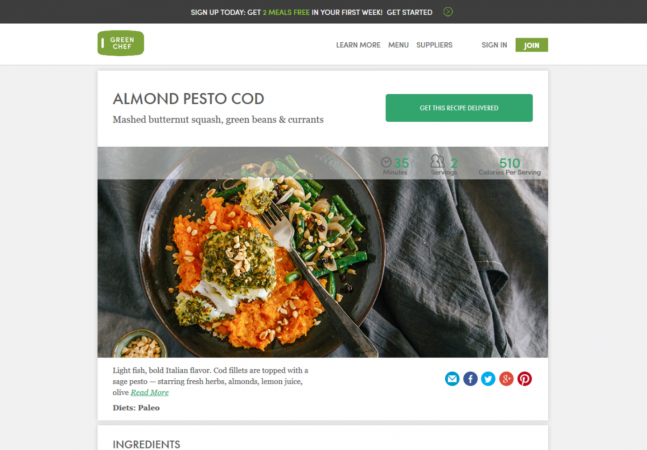 Trifecta delivers high-quality paleo meals nationwide and comes with rave reviews. Meals are pre-prepared to save you time in the kitchen. You can choose from a variety of customized meal plans based on nutrition, fitness, weight management, and body composition goals. Trifecta packages are pretty pricey. Order Trifecta meals like roasted pepper and tomato omelette with steak for breakfast, bison patty with roasted vegetables and pesto for lunch, or meatballs with spaghetti squash for dinner. All paleo meal services listed above deliver high-quality, healthy, and delicious meals or ingredients to your doorstep regardless of where in the U.S. you live. The best fit for you really depends on your budget and taste preferences, so view each delivery service's website to check out detailed menu options.